Why use A-1 Mini Storage in La Grande? When space is simply running out in your home or business, store your possessions securely and conveniently with A-1 Mini Storage. With more than 20 years of experience, Lloyd, Mary and Sarah provide you with storage solutions that are convenient, clean, affordable and perfect for any need. A-1 is a secure & very clean storage facility. Owners are so nice & we enjoy visiting with them. Location is great. I wouldn't store anywhere else. The moment we stepped into A-1 Mini Storage we knew that we had found our place. There are security cameras throughout so the facility was being closely guarded. The owners and staff were very friendly and accommodating with any needs or concerns we had. 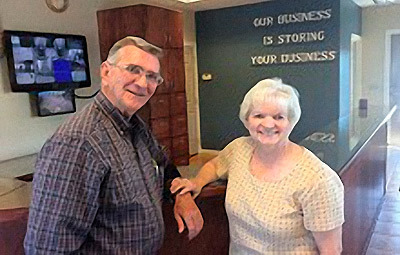 My wife and I have known Sarah, Mary and Lloyd for many years as clients of their storage facility (A-1). Our experience year after year has been superior. Not only do the provide the best services in storage but for U-haul as well. Though we recently moved away, we will always remember their helpful, smiling and efficient manner. Thanks for all your help over the years! My wife and I have known Sarah, Mary and Lloyd for many years as clients of their storage facility (A-1). Our experience year after year has been superior. Not only do the provide the best services in storage but for U-haul as well. Though we recently moved away, we will always remember their helpful, smiling and efficient manner. Thanks for all your help over the years! The best storage place ever. They are awesome and your stuff is safe there they have helped me when I was in need and they have security to keep the storage facility safe. Great to work with, and overall worth the time. They have always put out the effort in my experience.